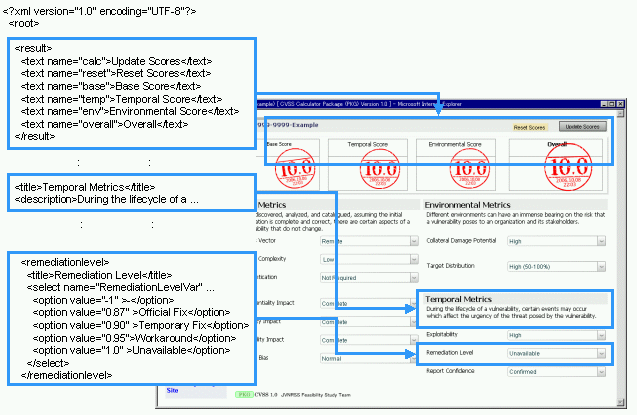 The Common Vulnerability Scoring System (CVSS), the emerging standard in vulnerability scoring. This rating system is designed to provide open and universally standard severity ratings of software vulnerabilities. A metric is a constituent component or characteristic of a vulnerability that can be quantitatively or qualitatively measured. These atomic values are clustered together in three separate areas: a base group (Base Metrics), a temporal group (Temporal Metrics), and an environmental group (Environmental Metrics). The base group contains all of the qualities that are intrinsic and fundamental to any given vulnerability that do not change over time or in different environments. The temporal group contains the characteristics of a vulnerability that are time-dependent and change as the vulnerability ages. Finally, the environmental group contains the characteristics of vulnerabilities that are tied to implementation and environment. The final adjusted score represents the threat a vulnerability presents at a particular point in time for a specific environmental condition. ScoreCalc.swf (Server Version) is enabled on JVNRSS Feasibility Study Site only. parameter.xml Parameter description file for CVSS V1.0 Calculator (ScoreCalc.swf) by each language and UTF-8 encoding. Spanish: Language translation is supported by paco. Chinese: Language translation is supported by CNCERT/CC. Korean: Language translation is supported by KrCERT/CC. Portuguese: Language translation is supported by Antonio Marques. Parameters of Demonstration Example ScoreCalc.swf are "ScoreCalc.swf ?name=CVE-9999-9999-Example &vector=(AV:R/AC:L/Au:NR/C:C/I:C/A:C/B:N) &temp=(E:P/RL:O/RC:Co) &env=(C:M/T:H) &g=999"
CVSSv1 CGI (cvss1.cgi) invokes ScoreCalc.swf with a stream of name=value pairs. Parameters of cvss1.cgi are "cvss1.cgi?name=CVE-9999-9999-Example &vector=(AV:R/AC:L/Au:NR/C:C/I:C/A:C/B:N) &temp=(E:P/RL:O/RC:Co) &env=(C:M/T:H) &g=999 &lang=en"
PC Version (ScoreCalcPC.swf) is enabled on your PC. 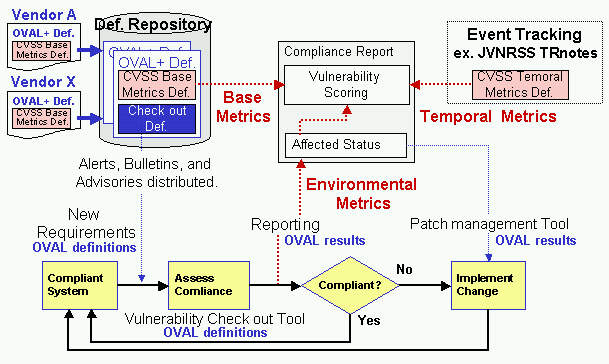 The letters within brackets represent possible values of CVSS Base, Temporal and Environmental Metrics. Exactly one option must be chosen for each set of brackets. Letters not within brackets are mandatory and must be included in order to create valid CVSS Base, Temporal and Score Environmental Metrics. Each letter or pair of letters is an abbreviation for a metric or metric value within CVSS.